Neurologists Friend and Tweet Too! Dr. Avitzur, a neurologist in private practice in Tarrytown, NY, holds academic appointments at Yale University School of Medicine and New York Medical College. She is an associate editor of Neurology Today, as well as the editor-in-chief of the AAN Web site, AAN.com, and chair of the AAN Practice Management and Technology Subcommittee. With over 400 million active Facebook users, it's not surprising that there is a budding community of neurologists among them. While it's unclear how many of us have an online presence on the site, on a recent visit I had no trouble recognizing the names of quite a few colleagues who follow the pages of Neurology, the AAN, and Neurology Today, and who belong to a variety of specialty and subspecialty groups. If you think social media is just for kids, consider this: Most Facebook users are between 35–54 years old, and the fastest growing segment are those 55 and older whose usage rose 513 percent during the first six months of 2009. Last June, a Massachusetts Medical Society poll of 800 members found that social media use grew 50 percent in the previous year, tripling among doctors aged 45 to 54. Neurologists are also adopting other social media tools such as LinkedIn, (a professional networking site with over 60 million members), and Twitter, (an information network of over 23 million members who post “what's happening” in 140 characters or less), to transmit online updates about their careers, personal lives, and whereabouts. The tools have become so popular among medical professionals and patients alike that a few weeks ago, a USA Today column predicted: “Doctors who fail to embrace social media risk becoming irrelevant, as more patients flock to the Web as a source of health information, rather than endure the inconvenience of a doctor's office.” While the validity of that opinion remains to be proven, experts do agree that physicians who use these sites face potential exposure to a minefield of legal and professional hazards if they are not careful. Neurology Today spoke with neurologists of all ages who are frequent users of social media to find out why they like it and to get tips on what to post and not post. AAN member Eve Gallman, PhD, associate professor in the Department of Cell Biology and Anatomy at the Medical College of Georgia, does not friend students until after they have finished taking her classes. She pointed out that privacy of information is a two-way street. Occasionally, she learns something about a former student that she would have preferred not to know. She uses the same cautions for Facebook that she does for e-mails: “I treat it like a public bulletin board,” she said. Eric Baron, DO, Clinical Neurology Fellow in headache medicine at the Cleveland Clinic, advised: “You should never post anything related to patients since this could potentially be a HIPAA violation.” He has personally blocked his Facebook page from being found on Internet search engines to make it even less visible to the general public, and believes that's probably a good policy. University Hospitals Case Medical Center Neurology Chief Resident Richard S. Jung, MD, is a future neurovascular fellow and a sophisticated user who started his Facebook page as a medical student in 2005 when it was only possible for alumni or actively enrolled students to sign up. “I would definitely not recommend anyone befriend any of their patients,” said Dr. Jung, who posts two to three times a week and logs on almost daily, mainly to keep in touch with friends. He also likes the Neurology journal page which notifies him of issues and updates even before he receives his hard copy in the mail. He cautions that confidentiality is difficult to maintain. “Although you think only your friends are able to view your postings, they may have friends who may view your profile when they're together,” he said. The lines between patients and physicians can get murky on social media. Many physicians feel uncomfortable accepting friend requests from patients, but feel awkward about rejecting them. As a rule, experts recommend it's best to ignore them. Andrew H. Ahn, MD, assistant professor of neurology at the University of Florida College of Medicine, has joined alma mater groups and a headache group to see what patients with headaches are saying outside the clinic. He foresees a potential for using social media as a powerful research tool with respect to patients, but has reservations about the ramifications in terms of patient rights and confidentiality. But Lynne P. Taylor, MD, a neuro-oncologist and general neurologist working at Virginia Mason Medical Center in Seattle, and member of both the Neurology Now editorial advisory board and AAN Membership Committee, believes that neurologists are already, by nature, very conservative, and that's there no need to make them even more cautious. Her experiences on social media sites (Facebook, LinkedIn, and Twitter) have all been positive. She recalled having cared for a very sick adolescent with hyperpnea, gait instability, hoarseness, and a peculiar cigar-shaped abnormality in his medulla on FLAIR MRI sequences. She and her colleagues were fairly sure it was a mitochondrial process, but ultimately referred him to Children's Hospital in Seattle and lost track of him. Four years later, she was thrilled to receive a message from his mother, who had found her on Facebook, telling her that her son's mitochondrial “diet” had worked, he was symptom-free, and had decided to become a medical translator. Samuel A. Frank, MD, assistant professor of neurology at Boston University, uses Twitter to both read and post general information about his subspecialty, movement disorders. “I like to do searches for conditions such as Huntington disease, for example, and receive press releases, new drug information, and a get a sense of what patients are seeing on the Internet,” he said. “When a patient comes to my office, I get one perspective; this gives me a bigger picture of what's going on.” One of his favorite Twitter features is trending topics. “It gives me a good idea of the hot topics people are discussing at any given time,” he said. Emory Neurology PGY-3 Resident, Casey Lee Hall, MD, a Facebook user, has concerns about discussing professional issues on such a publicly available site. “I think there's a fine line between representing your ideas and opinions as personal opinion vs. professional opinion,” he said, adding, this isn't always clear on “members only” listservs and can get even more blurred and easily misconstrued on social networking sites like Facebook. He pointed out that as the Internet becomes more pervasive, judging the quality of information is becoming very important. “Health information and library science experts are trying to come up with better ways to help others identify information of high quality and repute, so I think it is counterproductive for neurologists to use social networking sites to discuss neurologic cases and diagnoses,” he explained. The future neurocritical care fellow and fan of the AAN and Society for Critical Care Medicine pages does consider Facebook as a convenient and efficient way to keep up with conferences, meetings and society events without those worries. To keep up with the upcoming annual meeting hot topics, events, and sessions, be sure to check the AAN Facebook, Twitter, and LinkedIn page posts from AAN President Robert C. Griggs, MD, Science Committee Chair Stefan M. Pulst, MD, and AAN.com Editor-in-chief Orly Avitzur, MD. On Twitter, follow the #AANAM hashtag to follow all Annual Meeting related tweets. 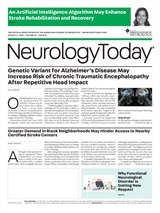 Neurology Today10(6):14-15, March 18, 2010.